The above is a great piece of analysis from The Economist – you can read the full article here. Investors who have held Australian property or shares have done pretty well for themselves with the right timeframe, so sometimes you may wonder why a financial planner would be so insistent on recommending international investments. We do it because we want your portfolio to be prepared for a wide range of outcomes – it’s a key factor in capital preservation. This means diversifying. The beauty for an Australian investor is that by adding international investments we tend to get a double dose of diversification. 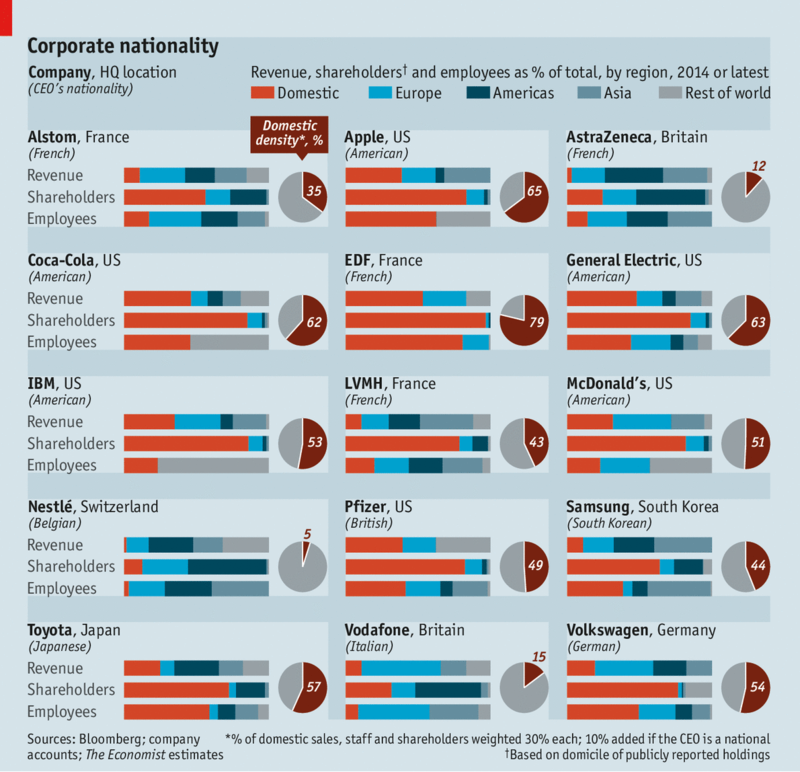 The image above shows some of the world’s leading companies. You might first note that the majority of them operate in sectors that are just unavailable for investment on the Australian stock market, so you have bought for your portfolio exposure to a greater range of industries. Then look also at the first bar graph for each company – this is breaking up where in the world their revenue comes from. Many Australian companies source a huge proportion of their revenue from the domestic market, so it leaves them particularly exposed to how Australia is going. Meanwhile, companies such as Coca Cola, Toyota, Samsung & Nestle have earnings from all over the world – that gives them much more balance in their earnings and much less prone to the fortunes of their home country. By adding a bit of international flavour to your portfolio, you’ll be opening yourself up to a much wider source of returns in the good times, and a greater balance of risks in the bad times.